it was our second year of owner-handled experience and what a big step it was! we accumulated total of 70 conformation points on several our dogs. Major part of this job was done by Lusha - Shazzam Of Oz Tactical Solution. 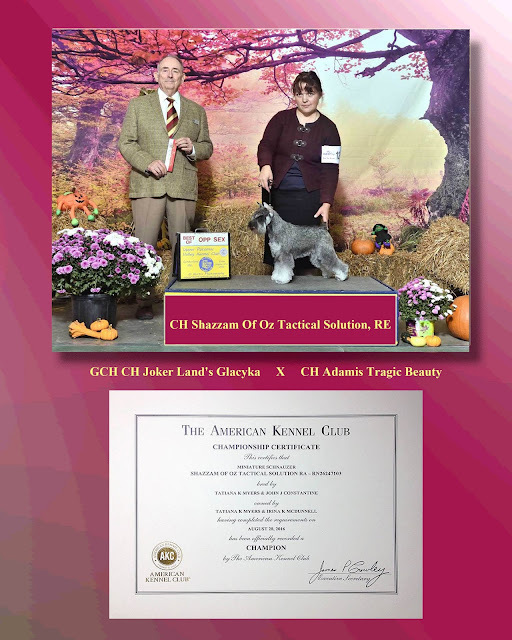 working title and well on a way to become AKC Grand Champion of record. By the latest AKC GR CH points ranking report for the State of PA.
who has working titles on her as well. Go Lusha! AKC Rally title and looking for more! Shazzam Of Oz Triple Crown (Roy) started competing in Rally Excellent. Shazzam Of Oz Enchanter (Chant) moved to Rally Advance! but not ready to compete just yet. All, but Lusha, who got to try her first 3 runs, but so far without the Qs. things are calming down and this is how it always suppose to be. re-think and get ready for another year full of adventures. or at list I hope so. It would be nice to update our main web site too, if I ever get to it.